Gorgeous and remote, this end of the road 4 bedroom, 3.5 bath home borders Custer National Forest, giving you a backyard that extends all the way to Yellowstone National Park! It is 106.6 acres stunningly perched on the flanks of the Beartooth Mountains in a private valley bordering public land on 3 sides. The interior is beautifully finished with log post and beam accents and natural wood for floors, walls, and ceilings. The great room centers on a custom rock fireplace. It is solar-powered with a propane back-up generator and in-floor radiant heat. It is made for the coldest weather with ICF Blocks and R-45 insulation. The wrap around porch gives you breath-taking views in all directions. Red Lodge is just 18 miles away via seasonal back roads or 35 miles via the state hwy. 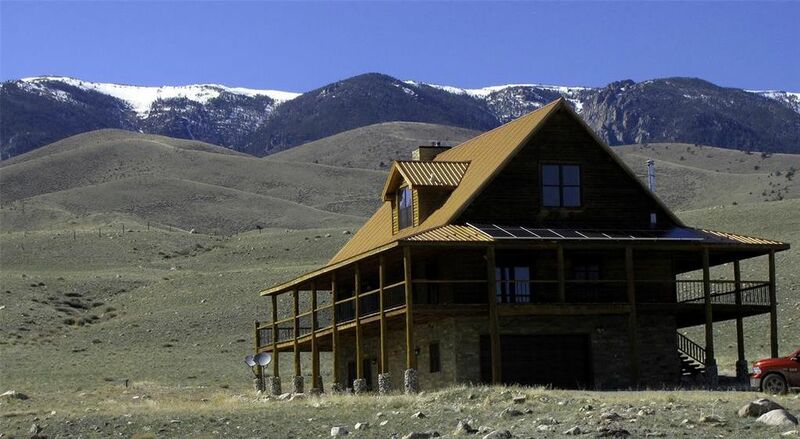 The location is the ultimate in privacy, yours to be shared with elk, deer & antelope. Cody is 45 miles to the south, while 65 miles north gets you to Montana's largest city, Billings and an international airport. Directions: SW of Belfry 18 miles; from Chance road, up Robertson Draw to Crazy Horse; Agent must accompany.